In this post I will show the basic usage of this plug-in and then how to create some templates with custom and complex filters for custom post listing and loops using PHP and WordPress functions. I will be referring to Custom Post Types as CPT from now on. Once you have installed the plugin, go to “Custom Content Types” in the administrator panel’s left menu, and create your desired CPT. 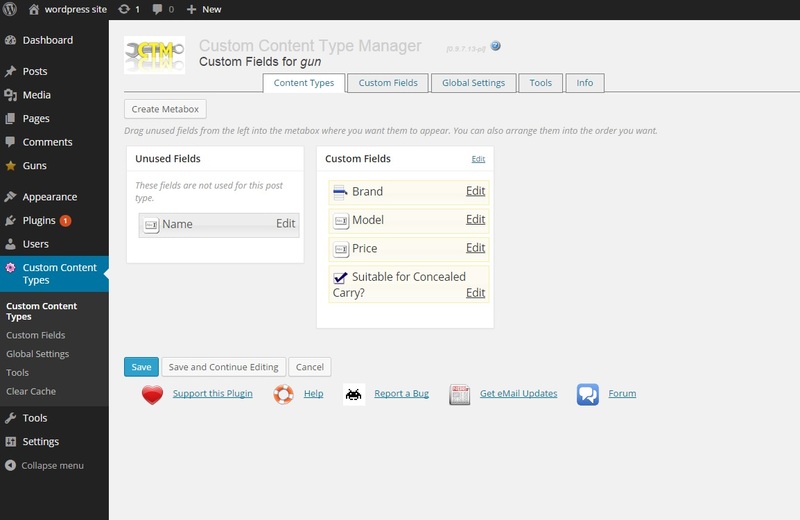 Then you can create the attributes’ names and types for this new CPT by clicking the “Manage custom fields” link on the list, as it is shown on figure 01. Then select the “Custom fields” tab above and click “create custom field” button to start. In order for the created CPT to appear in the WordPress administrator menu, you must activate them first (see figure 01). You can find the “activate” link under your CPT name in the list. One of the things I love the most about this plug-in is the availability and support for almost any attribute type you can imagine; and the way it works with different data types. Below you can find a list of all possible attribute types. You can also create validation rules, CSS classes, styles and output filters for each field in the following page, but as this is a quick guide, I won’t spend time explaining this since it is very clear and well explained in the plug-in’s documentation. And that’s it! Now you are ready to create templates with lists and post details for your CPTs. This is just one way for doing this, there are some other possibilities for achieving the same results. First of all we need to create a new template file inside our current WordPress theme (you can also create a new folder inside your theme root folder; let’s say “custom-templates” and they will be automatically loaded by WordPress too. This file loads a complete list of my CPT sorted by the custom field “BRAND” and with a “Published” status. ‘=’,’!=’, ‘>’, ‘>=’, ‘<‘, ‘<=’, ‘LIKE’, ‘NOT LIKE’, ‘IN’, ‘NOT IN’,’BETWEEN’, ‘NOT BETWEEN’, ‘REGEXP’, ‘NOT REGEXP’, or ‘RLIKE’. Default is ‘IN’ when “value” is an array, ‘=’ otherwise. ‘NUMERIC’, ‘BINARY’, ‘CHAR’, ‘DATE’,’DATETIME’, ‘DECIMAL’, ‘SIGNED’, ‘TIME’, or ‘UNSIGNED’. * Sample template for displaying single gun posts. * Save this file as single-gun.php in your current theme. 1 – Q: Pagination doesn’t work with Custom Post Types using “/%postname%/”permalink structure. 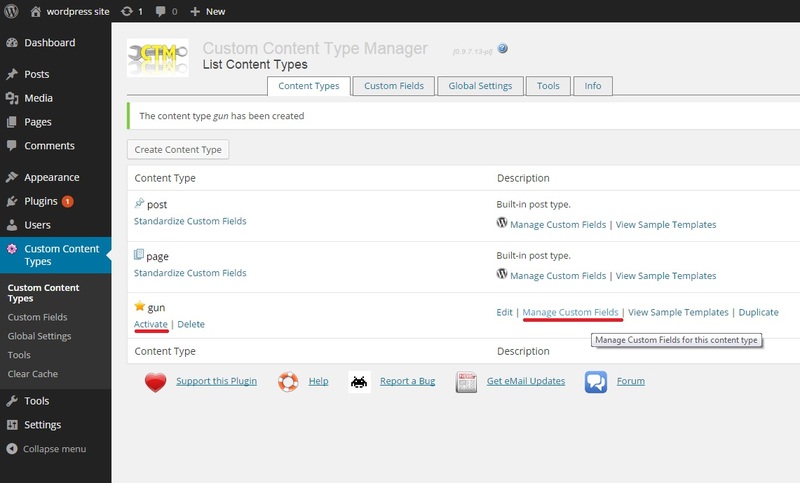 A: You must activate this option from the “Custom Content Types” menu on your WordPress administration panel’s left menu, then click on the “edit” link next to the name of your CPT, go to the “URLs” tab on the top (see figure 04 below) and select “/%postname%/” on the “Permalink Action” dropdown. Then save changes and you’re done! Go to WordPress settings page, under “permalinks” tab, select “default” option for links structures (http://mywordpress-site/?p=123) and save changes. Then select the desired permalink structure, in this case “http://mywordpress-site/sample-post/” and save changes again. This will refresh all existing posts structure. 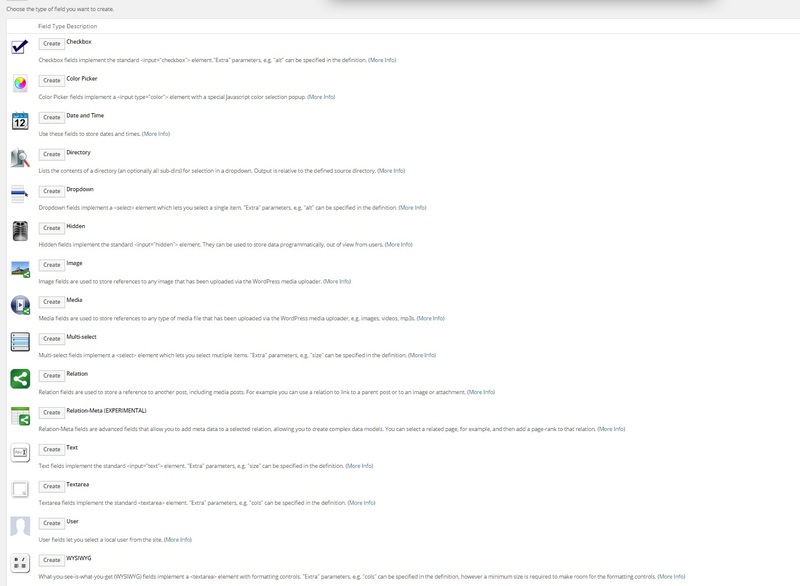 2- Q: After having moved my WordPress site to another server, custom post types pages in administrator’s panel are not showing up anymore (Post lists or edit/details pages). 3 – Q: After having moved my WordPress site to another server, created custom post types and/or attributes are not showing in administrator’s panel. A: You must import your Custom Post Types, previously exported from your website in jSON format on your previous server. Make sure the created/downloaded file has the following extension “.cctm.json”. Sometimes you have to change it manually from the file manager in your computer. For import definition: go to “Custom Content Types”->”import Definition”. Sometimes you need to clear cache as it shown on F.A.Q.#2 above after importing definitions for CPT to show on WordPress administrator’s menu.